The WWII myths will never die, especially when the likes of Mr. Parry et al. continue to find them useful to prop up whatever point of view. Tellingly, the war mongers who have occupied the White House since are using the same myth to turn the U.S. to an international terror organization. While you were relating your trip to Normandy, I remembered a political cartoon about D-Day that I saw in the months before Bush ordered the invasion of Iraq in March 2003. Scott Stantis penned it for a Tennessee newspaper (I saw it in my local one on the editorial page). It showed a view of Omaha Beach from behind one of the LSTs, in which Republicans were wading through the waves heading toward the beach, some falling, while all the Democrats were cowering in the LSTs. I was enraged. I sent off an email to Stantis and the Tennessee newspaper asking WTF!!!! I had close relatives, all Democrats, fight the Nazis over in Europe, and other close relatives, also Democrats, fight the imperial Japanese over in the Pacific. This political “cartoon” smeared all of them in implying that only Republicans fight for our freedoms, for our country. Incredible. Of course, neither Stantis nor the newspaper responded, which increased my opposition exponentially to starting a war in Iraq. Anyone, a Republican, or a newspaper or a Republican flack, willing to sink this low in a partisan “debate” was not anyone I would ever follow or believe. I supported Korea and Desert Storm. Most other US military actions I don’t. We should end our World Policeman role. It would save us a ton of money that we could use to rebuild the US. We could use the excuse the British used to give independence to their colonies. We can no longer afford it. I am a relic of the Great Depression and WWII Era. We are fast diminishing in number and it is distressing to know that the history we lived through is not often told as honestly or fairly as Mr. Parry’s account. I learned a lot about the political situation in the US at my father’s knee. I mean this quite lietally as I recall quite clearly a political discussion between my father and an uncle while crawling on the floor at the age of 3. They were discussing Al Smith and Tammany Hall. Would Al Smith run for president in 1928? My Dad, a staunch anti-prohibitionist was an admirer of Al Smith who also took a firm stand on prohibition. Dad, not a Catholic himself, was lamenting that the country would not vote for a good man because he was Catholic. I remember his words as: “No Catholic will ever be permitted to sit as president in the oval office.” Of course, eventually a Catholic did and my father lived to vote for him. So we should never get the notion that change in attitudes and values will not happen. It happens constantly and may even be happening now. My father, an Ohio farmer with a 7th grade education, was far better versed on the political events of his day than are most people today. A second cousin of Herbert Hoover, he was an FDR democrat and we children became familiar with all those acts and programs (NRA, WPA, CCC, etc.) that FDR (with the help of Eleanor) came up with during those grimmest of economic(Don’t even try to compare today’s deprivations with those of the 1930s.) times. We did not own a radio, or even have electricity in the farmhouse, but we had friends with radios and when FDR gave one of his fireside chats, friends and neighbors crowded into kitchens and parlors all across the nation to listen in rapt silence to every word FDR uttered. The effect of those fireside chats on the nation’s morale is rarely entered into the equation when the Roosevelt years are judged. He was enormously charismatic and he managed to capture and hold the nation’s ear throughout the longest administration in history. Those fireside chats are among my most cherished childhood memories. I am proud to say that I cast my first vote for FDR at the age of 21. Whether or not FDR knew in advance that Pearl Harbor was to be attacked, I never knew. What I do remember is that a very isolationist population was galvanized into action almost immediately and any young man accused of draft-dodging need not bother to ask a girl for a date. I lost a wonderful young husband, not quite 22, in the Battle of the Bulge. This came just 3 months after losing a beloved 19 year-old brother in France. A cousin was captured early in the African campaign and spent the remainder of the war in a POW camp in Germany where he was so severely beaten that the nerves in his neck were permanently damaged. An uncle also served in Africa and half of my high school graduating class never came back. My home town in Ohio had an extremely high causualty rate. All through that terrible war, our hearts at home were with our husbands, sons, brothers, uncles and friends we knew were fighting for the worthiest cause. At home everything was rationed and we saved our coupons for butter, eggs and other essentials and we made goodies to send overseas. Our evenings were spent writing letters. The kind of innocent patriotism and strong family ties that sustained us as we at home made our own quiet sacrifices might not seem “cool” today, but neither do they seem possible today. We have lost our innocence and replaced it with cynicism and suspicion. My hope is that, before it’s too late, we will see through all the political distortions, the fabrications and outright deceptions and somehow grow up as a nation and quit our warmongering and the destruction of the only home we have. Then we will find the way to choose the brightest and the best as leaders of a truly democractic nation. America has become the Israel Amos prophesied against for grinding the face of the poor and the Rome of the Apocalypse, proclaiming themselves peacemakers but conducting war. I hope to get my book written before I die, “The Great Separation: church and Christ.” The closer the union with the state, the farther the separation from Christ. What an odd allianceâ€”the Christian Right, duped by Republican promises of restoring Ozzie and Harriet and the Tea Party economic draconians. They are at cross purposes with each other, but the Christian Right is oblivious. Elected political representatives and their appointees in Washington of both parties do not represent the people or the country as a whole. It is plain to see the breakdown on all levels of American society, due to negligence, malfeasance and just not living up to their elected responsibilities, topped off by really not giving a damn. To label the USA as the so called “leader of the Free World” is an insult to the ‘free world’, whoever and wherever they are. Western civilization is such a misnomer! The following link is a history of our “interventions” from “destabilization” to frank, extended, totally unjustified and criminal war. Note the accounting stops before 2003, short of some of our national highlights of brutal, enemy-cultivating, depravity. My father worked for the WPA for seven years, and enlisted shortly after Pearl Harbor. Fought at Leyte, Luzon, and on Okinawa, and made his postwar career as an intelligence officer, retired as a bird colonel and worked for the NSA until his death in 1975. He and my mother are interred in Arlington Cemetery. Because of his experiences during the Great Depression with the WPA, my father was a very rare liberal Democrat in the military. He revered both FDR and Truman. He recognized that Vietnam was a war of choice that could not be won, and regarded it as a full-scale betrayal of the American armed forces by American politics. Further, both he and my mother came to hate and loathe the Republican Party. When one of his Republican counterparts at NSA gave him an American Flag lapel pin, my father returned it, saying that he did not need to be a latter day pharisee and perform the equivalent of praying in public so people would know that he was good. He said his service spoke for itself. My father would not recognize this country. What the Tea Party calls patriotism, he would flatly call treason. Indeed, it’s hard to see threatening to tank the American economy as anything but that. I think, however, that while he would be disgusted with the Republicans, he would ot be surprised by what they have become, seeing it simply as a logical extension of where they were heading. Rather, he would be bitterly disillusioned by the Democrats, who simply aren’t Democrats any more. This is no longer the country my father enlisted to defend and risked his life for. He would be ashamed. You have a wonderful insight in comparing today’s right wing and Tea Party supporters with past dictators and THEIR supporters. Barney Frank (D-Mass.) on the House Financial Committee, pointed out that one way to control the US financial problem is to stop our current wars.He said the US has become the “policemen of the world”, meaning we send in our troops any where to protect our major corporations. I could go on with other examples, but you and Mr. Frank have said it all. 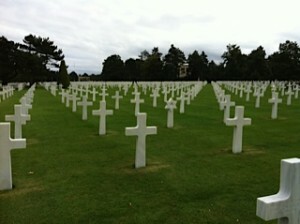 I have been been to Normandy and that part of France. It seems so peaceful now, well kept and clean. I saw that museum with Ike’s jeep from WW2. And I saw those white crosses. Our politicians, of all parties, have forgotten History. If you don’t remember History, you are damned to repeat it. This is not the exact wording, but it comes close. FDR gave money to the people, gave them jobs, so they could buy any thing from groceries to cars and homes. There are two charities which I began,besides teaching writing full time at the college level, so I have been strapped for finances over the past two decades. One deals with missing children, an issue which gets money for some false groups, but such funding finds no children. Again, keep up your work!